Though I had studied Islam in the past, this class provided an in-depth study into the creation of the Islamic faith, as well as how it was perceived by the outside world. Furthermore, the class stresses that Islam is not a monolith and explores how perceptions and practices differ amongst the religion's practitioners. I've always had an interest in international issues so I decided to take GOVT 5 - International Politics with Professor Wohlforth. I enjoyed the wide range of aspects covered in the class, as well as professor Wohlforth himself. I enjoyed my writing seminar, Hazardous Data, with Professor Kremer. My final paper, An XL Proposal with Larger Consequences won the Arthur Feinstein 1955 Memorial Fund First-Year Excellence in Writing Award. This class covers US foreign policy from the beginning of the 19th century until the present. I really enjoyed the ample time allotted to class discussion. The readings cover a broad range of strategies and historical events as well. This class surveyed films across of world from 1960 to around 1990. One film in particular, "Ali: Fear Eats the Soul"--a German film--is amongst my all-time favorites. To be completely honest, the best part about this course is Professor Dr. Nachlis. That being said, there are a ton of important and enlightening topics covered in this course. Don't worry, this course is also cross-listed as film class. Professor Isenberg from the New School comes to Dartmouth every summer to teach this course on European Exiles who came to Hollywood to make some of the most enduring films. Almost every film we viewed instantly turned into one of my favorites--and who doesn't want to spend part of the summer viewing movies. Surprise! another film class. It's not too often you can be so creative, but this screenwriting class allows writers to write any film of their choice while receiving feedback from the professor and the class. Winter provides plenty of great opportunities to take great pictures or do fun activities, but summer is still my favorite time of year. Summer is especially exciting at Dartmouth because there's so much to do. 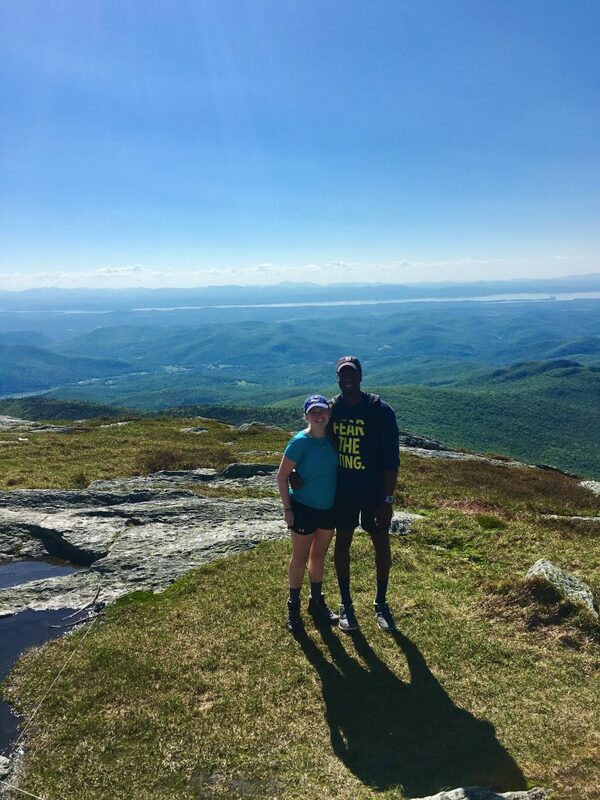 The top of Camel's Hump with my friend Amanda. A day after returning from the IRA Championships during the interim between spring and summer terms, I stayed a night in Hinman Cabin II before driving through Vermont and hiking Camel's Hump Mountain. What's especially cool is that students who are members of the Dartmouth Outdoor Club (DOC) can rent DOC cabins all over the Upper Valley for only $5.00 a night, while non-DOC students pay $10 a night. Summer is also great for spending time on the Connecticut River. Canoeing on the Connecticut last summer was actually my first time on the river not rowing, and it was a blast. There is a photo in the boathouse from the late 19th century with rowers in nearly identical poses. Though most of the rowing team is off during the summer, I had a bunch of fun hanging out with my fellow sophomore summer teammates. In addition to rowing through the week, the we would also barbecue and listen to music on the weekends. The school year can be quite a hectic time, but the summer was a nice time to get back to basics and enjoy my teammates and the sport.